WOW, this year went by faster than you can say "Girl Scouts Rock!" February was time for our FIRST Lego Teams to show their stuff, with qualifying tournaments, regional finals and another opportunity for a GSNC Team to go to the World Finals. Congrats to all, and extra kudos to The Icebreakers who capped their six years in FIRST with a third trip to the World Championships! March was so much fun as GIRLS took the lead as presenters at the Adult Recognitions Event! We can never do or say enough to thank and honor our VOLUNTEERS who go so many extra miles to give girls the gift of Girl Scouting. 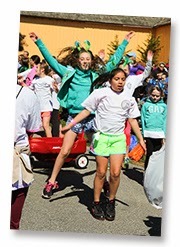 In April, we had beautiful weather and a perfect day for our "5th Annual Girls Go the Distance Walkathon and Activity Fair." Girls and their families had so much fun being active together, taking part in program activities and petting the horse! I highly recommend taking part in the 6th Annual Girls Go the Distance Walkathon and Activity Fair. d Bronze Awards. Thank you for inviting me and the members of our Board and staff leadership to join you in celebration! Summertime in Girl Scout world means camping ... Camp Blue Bay and Summer Fun Day Camp at Wantagh Park are chockablock with FUN, nature, friendships and yummy S’mores. I love SUMMER!!! This summer 19 high school-aged Girl Scouts took part in our inaugural Career Exploration Camp conducted by North Shore-LIJ Health System. My day to serve as staff chaperone just happened to be the day that was spent in the Operating Rooms! I still find it hard to believe that I was there with girls seeing real surgeries on real people! What an amazing opportunity these girls had! And then it all begins again with our Girl Scout "Back to Troop" activities ... We enjoyed bowling the day away at the Bowling Bash, had a scavenger hunt at Broadway Mall, and added Memories to our Mag&Munchies Program. We made new friends and reconnected with old friends as Troops gathered again to plan, take a Journey, and have FUN! And after working hard all year, we hosted our first GSNC STEM Conference for girls. We could not have done it without the leadership and support of our STEM Advisory Committee and Hofstra University who provided space, faculty and student volunteers! And the grant we received from ATT will continue to support the Conference and other STEM outreach to our girls. 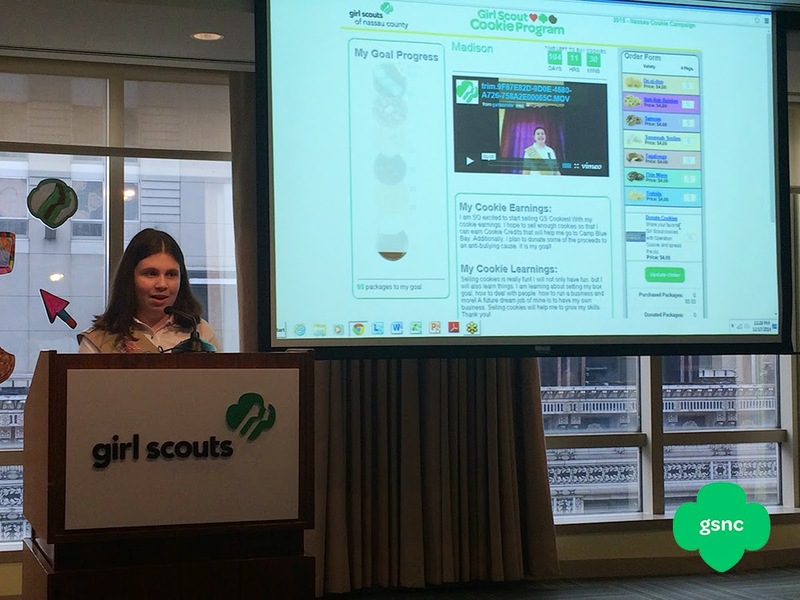 And this month GSNC became one of the first Councils in the country to launch Digital Cookie... I can't wait to see what 2015 has in store for our girls. from Girl Scouts of Nassau County! Wishing everyone a joyous and merry Holiday Season! We often think that because it’s winter, we are stuck inside… well that just isn’t the case. As long as it isn’t too cold and you bundle up for the winter weather, there are many fun and interesting activities you can do in the winter… most of them don’t even need snow. Warning: Fun will happen and a hat, gloves and winter coat are needed. Play tag, or hide and seek. These are great outdoor activities for any weather and snow forts make great places to hide. Watch the sunset. The sun sets much earlier in the winter than it does in the summer. Sit outside and watch the sun set. Does it look different from a summer sunset? Bird watch and work on your Animal Habitats Badge. Most birds usually fly south in the winter, but are there any birds that have stuck around for the cold season? Research birds that don’t fly south and learn as much as you can about them by observing them in their habitats. Collect pinecones to make decorations. Pinecones make great holiday ornaments when you add you own personal touch. Host a Girl Scout Cookie Walk-a-bout or a Cookie Booth Sale. Beginning at the end of January, gather the girls in your Girl Scout Troop and plan a Girl Scout Cookie Walk-a-bout around your neighborhood. Ask your Troop Leader for help with this. Play in the sand... or in this case the snow! Take out those sandbox toys and buckets and build some snow castles. Build a snowperson. You can even get creative and make your snowwoman a Girl Scout. If you are looking for a real challenge incorporate Girl Scout Cookies when you build your snowperson. Snow angels. Who doesn’t love trying to make a snow angel? The real test is trying to make a snow angel without getting hand or feet prints in it. Sledding. Living on Long Island, we don’t always have snow, but when we do, find a small hill in your neighborhood (one away from the street) and go sledding. Celebrating the achievements of our girls is always a top priority for me! Last Saturday, I was joined by Board Members Carol Ransom and Christopher Pendergast at the Planting Fields Arboretum in Oyster Bay to celebrate with the Top Sellers in the 2014 Mags&Munchies... and Memories Program. Twenty-two girls, each accompanied by a family member, came out to receive kudos and their rewards. We had an adventure finding the site of the event, and the best part for me and our Board Members was having the opportunity to speak informally with the each of the girls; to hear about how they approached the sale and how their Troops will be using their proceeds. The event was both beautiful and rewarding. The Green House at is currently all decked out for the holidays, and that is certainly worth a trip. Celebrating our girls as they earn and learn just reinforces their skills and makes it all worthwhile. I know that I will be seeing many of those same girls at the 500+ Club Celebration for our Top Cookie Sellers next spring! I hope that you will be at that event, too!